Crossover Day is a procedural deadline for a bill to pass either the House or the Senate to have a chance of clearing both chambers and making it to the governor's desk. 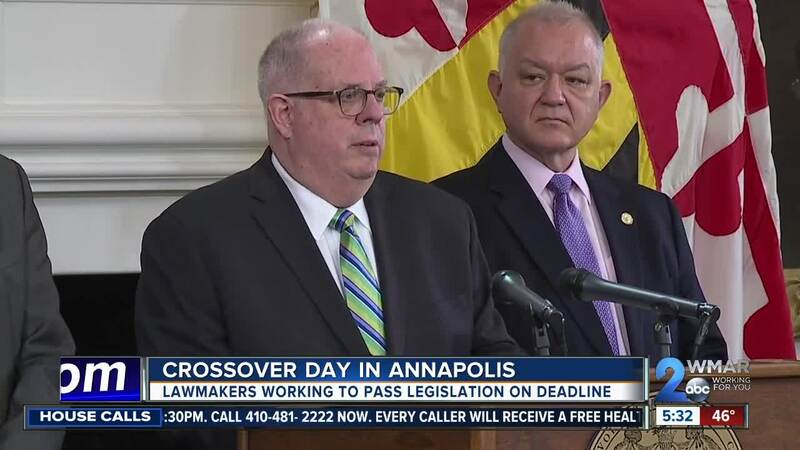 "Marylander's do not want to completely reverse course and return to the days of out of control spending, crippling tax hikes and job loss," said Governor Larry Hogan while concerned with the set of bills the legislature is pushing forward. One of the biggest chunks of spending is the education bill. The bill takes many suggestions from the Kirwan commission that was established to look into education spending. The cost of the bill for now is more than a billion dollars over the next two years. Lawmakers have admitted they don't have a plan yet to cover that spending. "These irresponsible and short sighted actions are threatening to make this the most harmful legislative session ever for Maryland tax payers," said Hogan. Hogan says he is willing to add money but, he says because of scandals, arrests and little or no accountability in education spending, he isn't willing to keep throwing money into the problem unless there is more transparency and accountability. "The legislature has again failed to take any action on any of these accountability measures. In fact the house appropriations committee attempted to cut funding from the office of education accountability that we set up last year," said Hogan. Sean Johnson is the Legislative Director for the Maryland State Education Association. "9,000 people turned out in Annapolis last week demanding that we take action on this conversation and we are pushing the governor to roll up his sleeves and work with the legislature to pass the blue print for Maryland's future and to make sure we make the critical investments our schools need," said Johnson. "But we can not repeat the same past mistakes the have continued to fail parents, teachers, students and tax payers of our state" said Hogan.